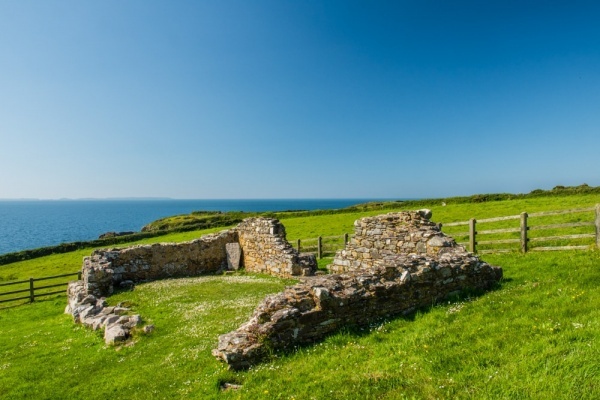 St Non's Chapel is the traditional birthplace of St David, located in a beautiful coastal location just south of St Davids. The chapel is dedicated to Non, David's mother, and it was a destination throughout the medieval period. A few steps from the roofless chapel site is a holy well, still used by modern pilgrims. Non is also sometimes known as Nonna or Nonnita. Much of what we know of her life comes from the writings of Rhigyfarch, an 11th century Norman cleric whose father served as Bishop of St David's. According to Rhigyfarch's florid account, Non was raped by Sanctus, King of Ceredigion and conceived a child. A tale spread that the unborn child would be a great spiritual leader when a preacher found himself unable to preach in Non's presence. A local ruler feared the power of the child and plotted to have him killed, but the day of David's birth the weather was so foul that no one could venture outside. In the midst of the terrible storm the place where Non was giving birth to David was bathed in light. The pain of the birth was so intense that Non grasped a rock and it split apart in sympathy. When the child was born a church was erected on the spot and the broken stone, marked with Non's fingerprints, was buried in the foundations of the altar. There are several versions of the rest of Non's life. One version says that she travelled to Cornwall, another that she founded a convent at Llanon, which was named for her. 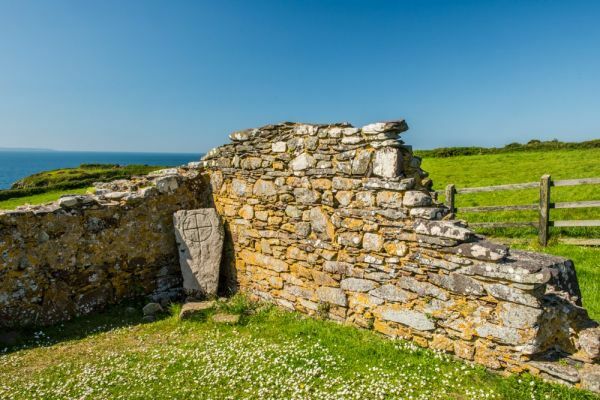 Though the remains of the Chapel are scanty, it is still an evocative site, and it is sobering to realize that you walk in the footsteps of countless pilgrims as you approach the holy well, then pass on to the chapel itself. Many people leave an offering at the foot of the striking statue of St Non that is set in a niche near the well. It is very difficult to determine how old the Chapel is. The first documentary evidence comes from 1355, but several facts suggest a much earlier date. Leaning against one corner of the Chapel is a pillar stone with an incised Latin cross. The carved stone likely dates to sometime between the 7th and 9th centuries, though there is no way of knowing whether it has always stood at the Chapel site. 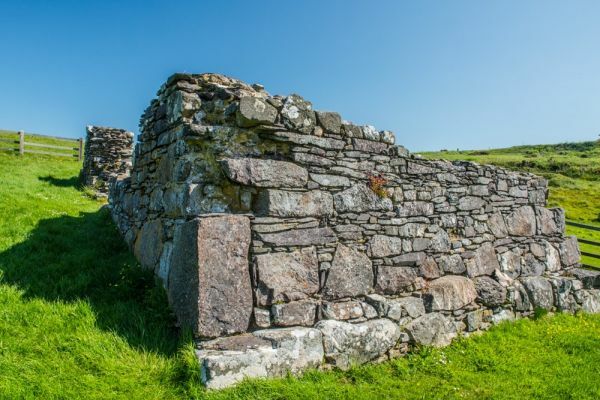 Another fact suggesting an early date for the Chapel is that when archaeologists investigated the site they uncovered stone-lined graves from the early Christian era. The Chapel layout is very simple. It is a rectangular building oriented on a north-south axis, with an entrance in the west wall. The site slopes considerably, which probably explains the much heavier masonry on the south, or downhill side. At the north end of the Chapel is a raised platform marking the site of the altar. The Chapel was a popular destination for pilgrims. Donations left by the pilgrims was given to St David's Cathedral. When pilgrimages dried up after the Reformation the Chapel was used for a time as a dwelling and then as a walled garden. On the path leading to the Chapel is a well whose water is traditionally said to have healing properties. People continued to visit the holy well long after the Reformation, and leave offerings. 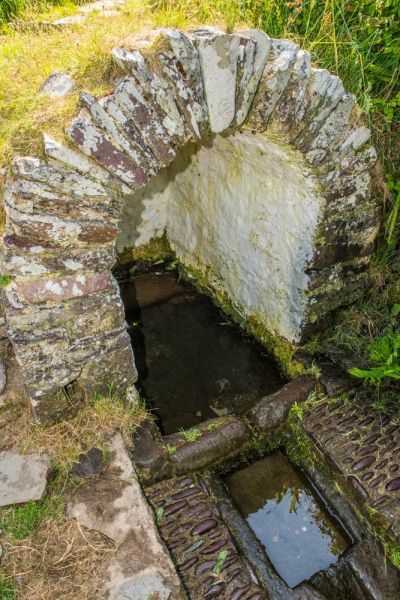 The most popular day to visit the well was St Non's Day, 2 March. Over the well chamber is an 18th century stone vault, though this may have simply replaced a much earlier wellhead. 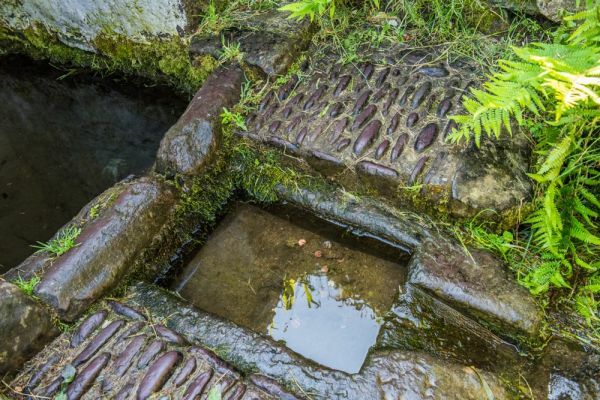 From a small basin under the wellhead the water runs out a channel into a square stone pool, and then away through another stone-lined channel. 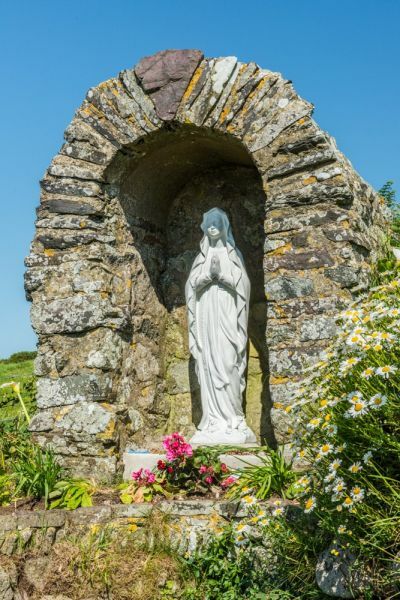 A few steps away from the well itself is a stone niche holding a statue of St Non. Modern visitors often decorate the statue with offerings of flowers, beads, ribbons, and other small items. The chapel and holy well stand just below a Catholic retreat centre. In the grounds of the centre is a lovely little early 20th century chapel, built with ancient stones. 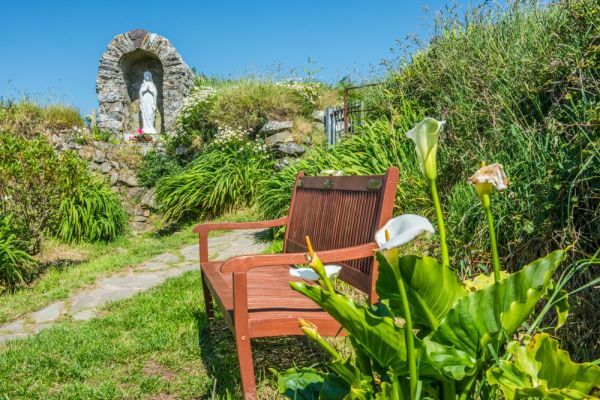 The chapel is open to visitors and stands just a few steps from the South West Coast Path. 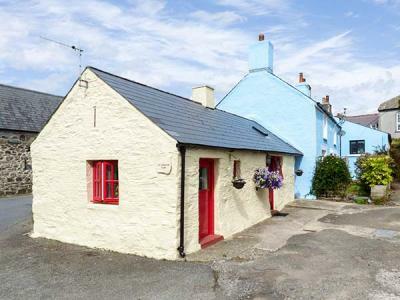 St Non's Chapel can easily be reached on foot from St David's. The route is signposted off Goat Street at its junction with Pit Street. From Goat Street turn south along the lane and follow it south for 1/4 mile, past a country house hotel on your right. After 10 minutes or so you will see St Non's Retreat Centre ahead of you. Just before you reach the Centre you will come to a signposted footpath to your right. This leads directly to the holy well. 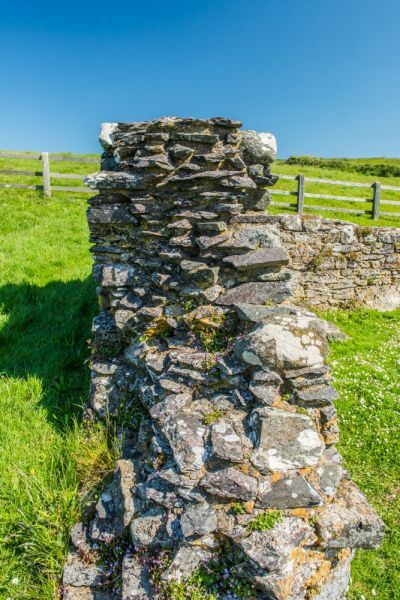 From the holy well you pass through a stile into an open field where the ruins of the chapel are easily seen just ahead of you. If you do not fancy a walk from St David's you can follow the same route in a car, parking at the Centre.